Not to be confused with the Bible study software called Xiphos, for which, see The SWORD Project. 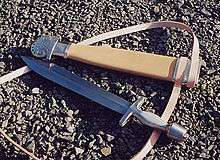 The xiphos (Greek: ξίφος) is a double-edged, one-handed Iron Age straight shortsword used by the ancient Greeks. It was a secondary battlefield weapon for the Greek armies after the dory or javelin. 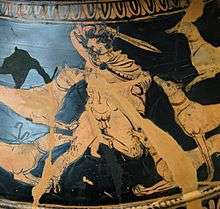 The classic blade was generally about 50–60 cm long, although the Spartans supposedly started to use blades as short as 30 cm around the era of the Greco-Persian Wars. The xiphos sometimes has a midrib, or is diamond or lenticular in cross-section. It was generally hung from a baldric under the left arm. The xiphos was generally used only when the spear was discarded for close combat. Very few xiphoi seem to have survived. Stone's Glossary has the xiphos being a name used by Homer for a sword. The entry in the book says that the sword had a double-edged blade widest at about two-thirds of its length from the point, and ending in a very long point. The name xiphos apparently means something in the way of "penetrating light" according to researcher and swordsmith Peter Johnsson. The early xiphos was a bronze sword. In the classical period it would have been made of iron. The early Celtic La Tène short sword, contemporary with the xiphos, had a virtually identical blade design as the xiphos. The leaf-shaped short swords were not limited to Greece, as mentioned, but can be found throughout Europe in the late Bronze Age under various names. Bronze leaf-shaped swords from as early as the late second millennium still survive. The Urnfield culture is associated with the use of the leaf shaped bronze short sword. It is generally thought that iron swords had replaced bronze swords by the early La Tène culture about 500BC. During the Halstatt culture a mixture of bronze and iron swords seem to have existed side by side. Iron tends to become severely oxidized (rusted) over the years, and few iron swords have survived, in contrast to bronze swords that age very well. Thus, much is known regarding the sword during the Bronze Age but less so in the early Iron Age. Bronze thrusting swords from the second millennium still exist in excellent condition. The word is attested in Mycenaean Greek Linear B form as 𐀥𐀯𐀟𐀁, qi-si-pe-e.[n 1] A relation to Arabic saifun and Egyptian sēfet has been suggested, although this does not explain the presence of a labiovelar in Mycenaean. One suggestion connects Ossetic äxsirf "sickle", which would point to a virtual Indo-European *kwsibhro-. ↑ Qi-si-pe-e is thought to be the dual number nominative case form of *qi-si-po; that is, its meaning is "two swords". It is found on the PY Ta 716 tablet. Mycenaean 𐀞𐀏𐀙, pa-ka-na, could be an attested form of φάσγανον, phasganon, the famous Homeric word for sword. A sword is usually represented iconographically in Linear B by the ideogram 𐃉. ↑ ξίφος. Liddell, Henry George; Scott, Robert; A Greek–English Lexicon at the Perseus Project. ↑ "Archived copy". Archived from the original on March 31, 2012. Retrieved January 26, 2009. ↑ "The Linear B word qi-si-pe-e". Palaeolexicon. Word study tool of Ancient languages. ↑ Raymoure, K.A. "qi-si-pe-e". Minoan Linear A & Mycenaean Linear B. Deaditerranean. ↑ "PY 716 Ta (2)". DĀMOS: Database of Mycenaean at Oslo. University of Oslo. ↑ Heubeck, Alfred (1958). "MYKENISCH *qi-si-po = ξίφος". Minos (in German). 6: 114–116. ↑ φάσγανον in Liddell and Scott. ↑ "The Linear B word pa-ka-na". Palaeolexicon. Word study tool of Ancient languages. ↑ Raymoure, K.A. "pa-ka-na". Minoan Linear A & Mycenaean Linear B. Deaditerranean.